Very pretty example of this always popular pattern, with pastels, floral prints, calico and soft red fabrics in a sweet and cheerful combination. All hand pieced and hand quilted, with 6 to 7 stitches to the inch, this is a tour de force, since the pattern is one of the more difficult ones to piece. The main body of the quilt is in excellent condition with the fabric intact. No major stains other than some tiny pink prick rust spots at the very top edge to the right of the middle and around corner in the last row of hexagons.There is wear to the edges (last row of hexagons) with the top edge showing the most wear. Could easily be bound. See pics. Here’s a bit of the history of this pattern. In the late 1920s, an American quilt revival brought in a new color palette of pastel prints. Quilts made from these fabrics are sometimes referred to as Depression Quilts, since the styles and fabrics continued through the Great Depression. The 1830s Hexagon Mosaic pattern was revived in the 1920s and retitled Grandmother's Flower Garden, which, according to quilt historian Merikay Waldvogel, was the most popular pattern of this period and remains so even today. The more distinguished of these quilts, display dynamic edges that model the contour of the floret pattern. 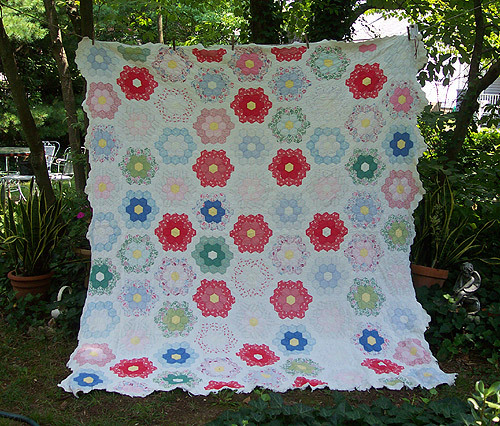 Grandmother's Flower Garden quilts bring to mind the Great Depression of the 1930's. We can imagine our own grandmothers busily sewing together one of these lovely quilts using scraps from her scrap basket. Such a quilt would be a cheerful reminder of colorful flower gardens; a much needed lift during hard times. This pattern had become very popular during the 1920s and continued to be a favorite for many years. This pieced hexagon quilt had roots in England as far back as the 18th century. Immigrants soon brought this pattern to America. Hexagon templates for these quilts have been found that were made around 1770. This leads historians to believe that the hexagon pattern might be one of the oldest pieced patterns. Lovingly made, beauiful piecing, machine stitched and hand tied. Binding is handstitched. Cotton calico,solids and muslin fabrics, in natural and earth tones. Backing is muslin, white embroidery floss ties which knot on the backing. Five brown fabric tabs across the top to loop a hanging rod. Very puffy batting. From the colors, I'd date this late 1970's or 80's. Excellent condition. No wear. Measures 29 x 31 1/2" not including tabs. $45.